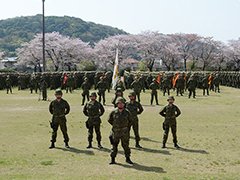 The JGSDF 8th Division reorganization ceremony was held at Camp Kita Kumamoto on Saturday March 31st, 2018, under the command of General Yoshihide Yoshida. The 8th Division was reorganized as a Rapid Deployment Division with improved rapid deployment capabilities to respond quickly and effectively to various contingencies including attacks against remote islands. 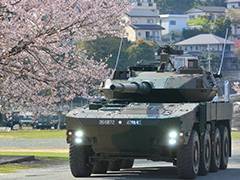 Additionally, a Rapid Deployment Regiment was newly established under the Division, which is equipped with the new highly mobile Type-16 Maneuver Combat Vehicle and organized as a combined arms unit with infantry, armor, and field artillery in a single package. 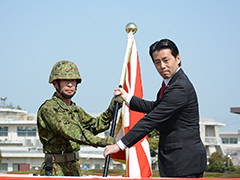 Therefore, Mr. Fukuda, the Parliamentary Vice Minister of Defense presented the regiment color to Colonel Masanori Suenaga, the commander of the 42nd Rapid Deployment Regiment.